I help women healing their bodies with the Paleo diet learn how to grow abundant organic food all year in small spaces. 10. I love this. So incredibly clear. I don’t have much to add but I find myself wondering what might be the top three conditions from which these women are healing their bodies. Sometimes naming those can help. But basically, you’ve nailed it. I know who you’re serving and what point of view you’re coming from. I know what result you’re offering and it’s incredibly specific. This is such a gift to the world. I love it. 10/10: I love this! If you were local to me, I could even send you clients! 10/10: Cool, If i was a woman on a Paleo diet I’d be calling you now. 10/10: Clear as a bell. 10/10: Utterly clear and wonderful. I’d want to know more! 9/10: Only question is why only women? 10/10: Yep, That’s super clear. I’d love to learn how to grow nutritious food in small spaces! 9.5/10: perfectly clear only less than 10 cause the phrase felt like a mouthful. So it may just be phrasing and slight tweaking. 10/10: Would love to hear how this niche going for you and how your biz changed once you identified this niche. 9/10: Like it, just why include “bodies?” I like the bit that I can learn to grow organic food all year and on a small space. Mentioning the the Paleo bit can put some people off before they have learned what it’s about. 9/10: I think it’s super clear, but I would have liked the wording to be a bit more dynamic. 10/10: Incredibly specific and clear. 10/10: I love it. Very niched and specific. 9/10: I went to your site right away! I really really really love the part about teaching how to grow organic food all year in small spaces, because that’s exactly me. and I know nothing about gardening, so I just don’t. I’m not on the Paleo diet though. I think the wording in the first part can be adjusted a bit. Can’t quite put my finger on it. Maybe it’s just missing a comma? Regardless, this is awesome! 10/10: Brilliant! 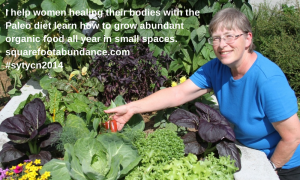 I particularly like the boldness of “women” “healing” and “Paleo diet” because it distinguishes you from other square foot gardening resources. Courageous, because I can see from your website that you could appeal to any number of other groups. 10/10: I give this a 10 because I know exactly who she is talking to. When I give local talks on this type of gardening (not focused on Paleo clients), about 80% of the attendees are middle-ages women. I fully expect my audience will come from a wider audience that that, but they seem to be the ones most interested. And the ones I can most relate to. My site actually does appeal to many other groups. (I don’t turn them away!) But I belong to the group “women healing thru the Paleo diet.” The Paleo community has many fantastic hubs, and the community and leaders are very supportive of each other — with a mutual goal of helping people to heal. I want to give back to this wonderful community with the skills and knowledge that I have to offer. I’m not worried about “Paleo” putting some people off, as my website doesn’t really mention Paleo at all. I just want to reach out to the Paleo community, to help them learn how to produce abundant organic food all year-round from small gardens. I have identified this niche as one I very much want to approach, but I haven’t started working with it yet. Meanwhile, my website has become pretty popular with the square foot gardening community (13,000 visitors this month).